The maxillary canine is usually the longest tooth in the mouth. 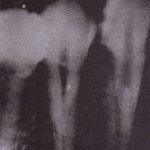 The root is oblong in cross section and usually produces a bulge called the canine eminence on the anterior surface of the maxilla. The result is that the bone over the labial aspect of he maxillary canine is usually quite thin. In spite of the thin labial bone, this tooth can be difficult to extract simply because of its long root. Additionally it is not uncommon for a segment of labial alveorar bone to fracture from the labial plate and be removed with the tooth. The upper universal (no. 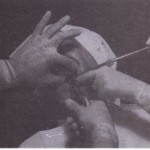 150) forceps is the preferred instrument for removing the maxillary canine. As with all extractions, the initial placement of the beaks of the forceps on the canine tooth should be as far apically as possible. The initial movement is to the buccal aspect, with return pressure to .the palatal. As the bone is expanded and the tooth mobilized, the forceps should be re positioned apically. A small amount of rotational force may be useful in expanding the tooth socket especially if the adjacent teeth are missing or have been extracted after the tooth has been well luxated it is delivered from the socket in a labial incisal direction with labial tractional forces (fig. 7-61). 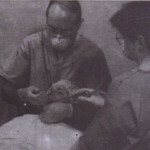 If during the luxation process with the surgeon feels a portion of the labial bone fracture a decision must be made concerning the next step if the palpating finger indicates that a relatively small amount bone has fractured free and attached to the canine tooth the extraction should continue in the usual manner with caution taken not to tear the soft tissue how ever if the palpating finger indicates that a relatively large portion of labial alveolar plate has fractured , the surgeon should stop the’ surgical procedure. Usually the fractured profound bone is attached to periosteum and therefore is viable the surgeon should use a thin periosteal elevator to raise a small amount of mucosa from around the tooth,down to the level of the fractured bone. 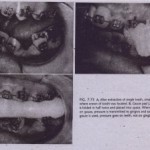 The canine tooth should then be stabilized with the extraction forceps; and the surgeon should attempt to free the fractured bone from the tooth, with the periosteal elevator as a lever to separate the bone from the tooth root. If this can be accomplished, the tooth can be ‘removed and the bone left in plate attached to the periosteum. Normal healing should occur. If the bone’ becomes detached from the periosteum during these, attempts, it should be removed, because it is probably nonvital and may actually prolong wound healing. This procedure can be used whenever alveolar bone is fractured during extraction. Prevention of fractured labial plate is important. If during the luxation process with the forceps a normal amount of pressure has not resulted in. any movement of the tooth, the surgeon should seriously consider doing an open extraction. By reflecting a soft tissue flap and removing a small amount of bone, the surgeon may be able to remove the stubborn canine tooth without fracturing a larger amount of labial bone. By using the open’ technique, there will be an overall reduction in bone loss and in postoperative healing time .